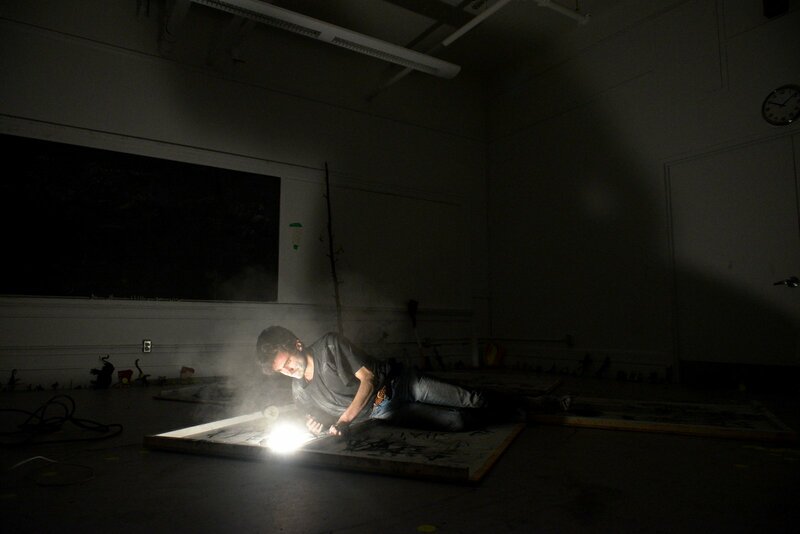 When I enter the performance space, Didier Morelli is climbing the wall, rubbing the blackboard with his face. He is removing the remnants of John Court’s festival performance from the board. His cheeks and lips are caked white and dusty. To get the few remaining marks high on the board he jumps and hangs from the edges by his fingers, swinging left to right like a pendulum. Continuing until all the markings have been removed/have transferred to his skin, he jumps back. He seems satisfied and grabs a fresh piece of chalk from the tray and turns to John once again. Using his non-dominate hand to write out these names has already undercut their influence, and our ability to misconstrue this as any sort of honour. This is not a list of his favorite things. With a quick flip, Morelli is in a hand-stand and his feet are against the board. Holding a piece of chalk between his toes he makes new marks and skews the words’ legibility even further. Morelli’s actions may not be precise but they are still exact—his outcomes are only relevant in light of how his actions are irreverent. Morelli is strategic in his dissent. 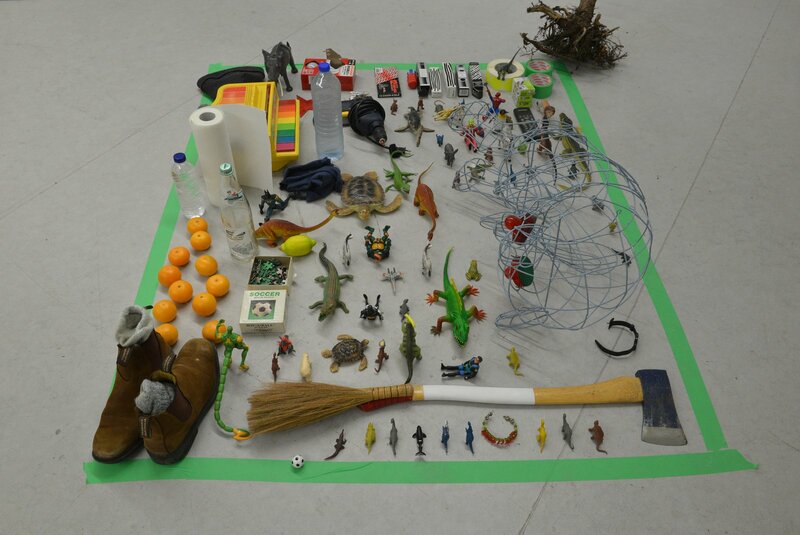 Around the room are a variety of objects. Leaning against the wall is an uprooted tree, and within an area outlined by painter’s tape he has placed a mixture of items for work and play (including a puzzle, toy animals, an axe, and work boots), ways to clean (a small broom and paper towels), and food to eat (clementines). 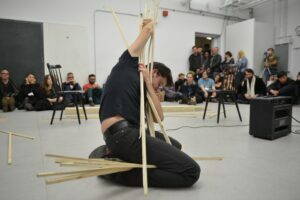 Didier Morelli’s performance is four hours long, and throughout he engages his body in demonstrative feats of agility, endurance, play, and physical/psychological strength, and he spends a lot of this time alone. He stands on his hands to wipe the chalkboard with his feet. He lifts a heavy wooden box onto his chest, and then stays inside this box for over an hour. 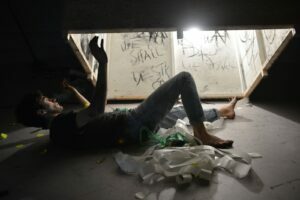 He scrawls the words ‘I Am Making Art’ in charcoal on the walls within the box which over time grows quite hot (a result of both Morelli’s activities and the heat from the single light bulb encased inside). He stands on the side of his head. He sweats. He yells from inside the box at a video playing on a television outside. “We Shall Destroy… the Program!” he shouts, pushing against the walls so it lurches to and fro as though it contains a beast trying to break out. “We Shall Destroy… the Program!” he shouts again while the video of Pope John Paul II plays on a television set (I can hear sounds of the pope saying ‘wooooo, woooo’ amidst a murmur of cheers). Morelli, still in the box, is interested in eating a clementine. Asking if someone could please help him by fetching one, he reminds us he also needs it peeled since his hands are too dirty, and to please hand it to him in smaller pieces since it’s too large to fit through the holes on the side of the box. Several people oblige his request, and for a moment Morelli rests. Morelli is interested in challenging norms. 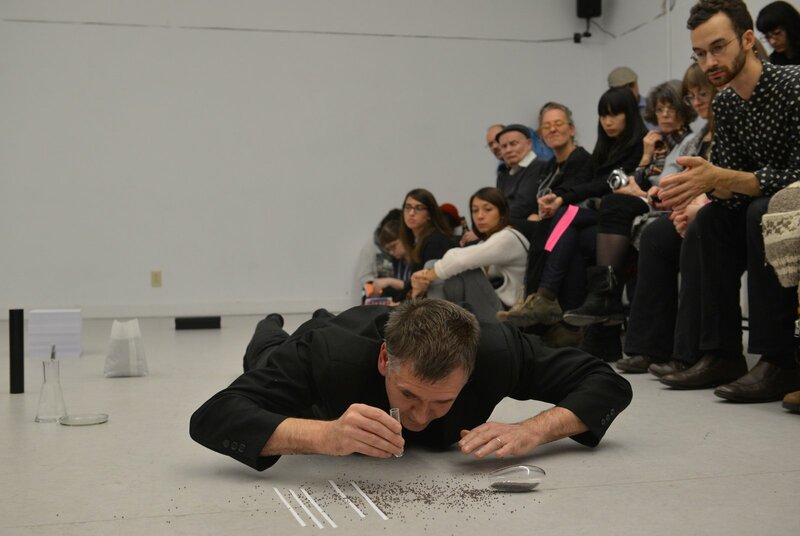 His actions in performance pose questions and offer critical perspectives on what is considered impossible, in time and in space. 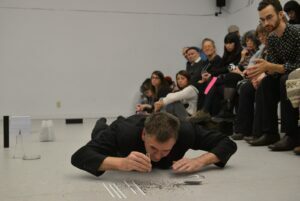 In this performance, Morelli is challenging certain primacies of performance art canon by demonstrating a form of absurd alternative leadership. Watching him for the first full hour, I was struck by what the images and actions conveyed about the difficulties of mounting a significant opposition, and how lonely being potential leader can be. For example, in one segment of his video “I Am Making Art, Part 2”, a figure is waiting in a public square filled with empty chairs, as though hoping to give a speech but no one is there. Flashing images on the screen next show a figure in a cage of unspecific dimension, and then the words “Pause, for physical transcendence.” I decide this is a good time to leave. One hour goes by and I look in on Morelli again. This time I see that he’s out of the box and is now standing on top. 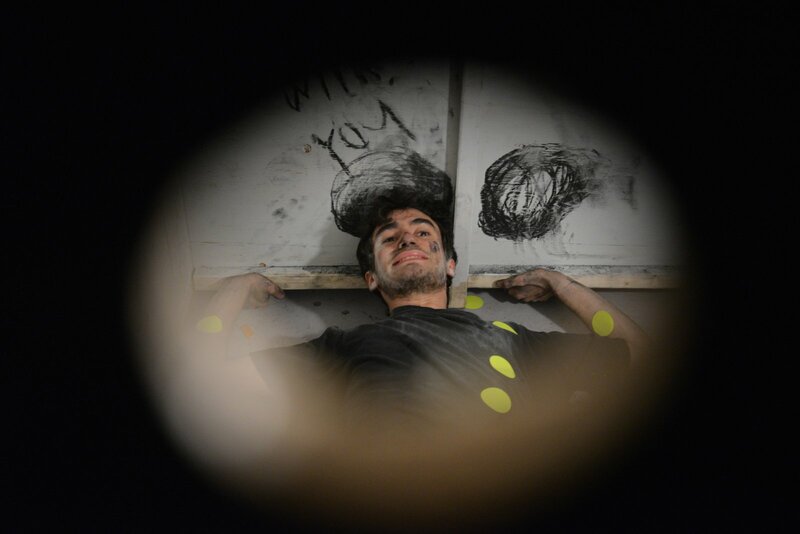 A roll of florescent yellow stickers in hand, he’s caught in a loop of repetitively slamming the sticky circles onto a point of the wall in a defiant action of emphasis. This continues for several minutes before I duck out again. Only a short while later, I poke my head into the room once more. A string of yellow stickers traces Morelli’s movements like some kind of day-glo bread-crumb trail down the wall, and around the room. 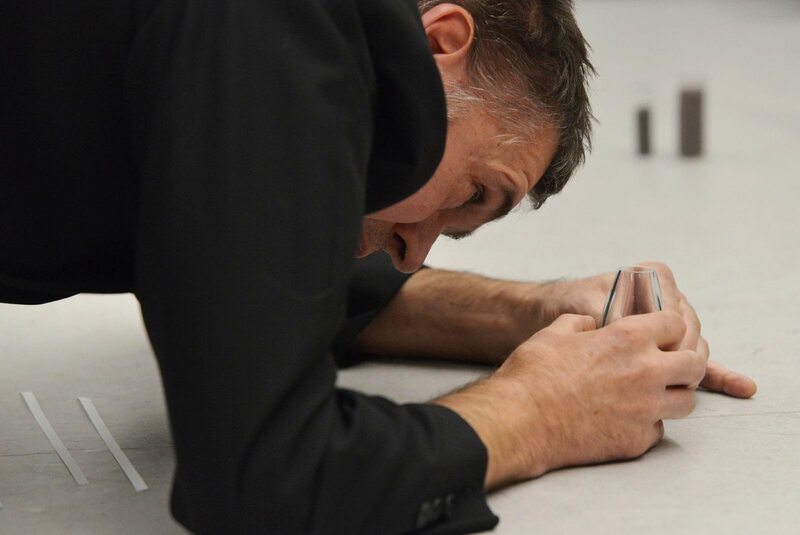 Following this line with my eyes I find him, crouched down on the floor taking turns placing stickers on a toy piano. His playmate is a baby boy. They are teaching and learning together, and these stickers mark the way. To make it possible for others to follow, he has placed stickers on himself too. He’s not the destination. He’s just part of the process. Making actions and moving, building and breaking down. Later, I look in and see that at some point Morelli has dismantled the box. Later still, I notice he has lined up all his objects around the perimeter of the room, in a marching line. Perfectly placed and spaced. As we near 10 pm, the festival crowd gathers to watch Morelli draw his performance to a close. 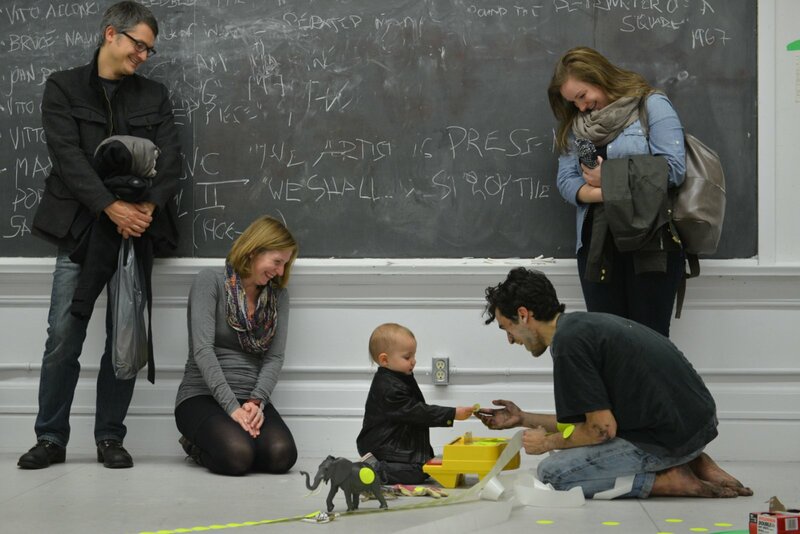 We find him in the place where he started: wiping off the blackboard and all its names with his face. Climbing and taking action to remove this history, he obliterates it to dust using a mixture of love and aggression. He finishes, and switches the lights off. On hands and knees he scratches a piece of chalk against the floor. Manufacturing new chalk dust and back lit by a single bulb he gathers it up. Then, pausing for only a second, he blows it away. Anya Liftig has just asked me a confusing question, but as soon as I look at her I understand. She’s asking me if her eyeliner looks okay. I bend in and examine her handiwork. “A bit thicker?” she asks. “Everyone is going to get close to my face,” she says and turns back to the mirror. A minute later she leaves the backstage area. I feel slightly bewildered, but an hour later I will totally understand. Indeed, we’re all about to closely examine her entire face. We’re about to Know it Well. The lights go out and the orange tent in the middle of the room glows like a fake jack-o-lantern from Canadian Tire (it is, after all, the day before Hallow’een so forgive this timely simile). Inside, Anya Liftig is fussing about in this little place within the performing space. The sides of the tent rustle a bit here and there and a projection flickers onto the outside room’s wall. Liftig’s face appears, much much larger than life. Her eyeliner is even, her lips are dark red, and her big blue eyes stare. She’s watching the room and piercing its darkness and the effect is unsettling, and maybe as much for us as for her. 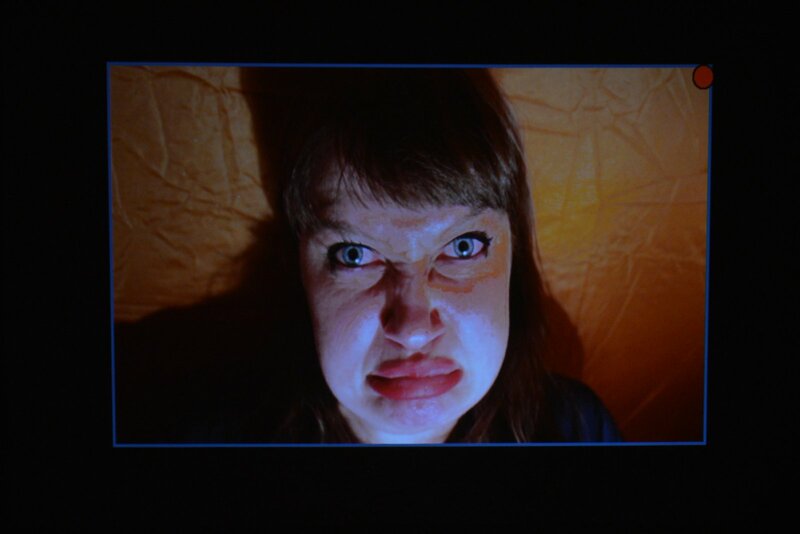 In her work, Liftig always begins with something that she finds terrifying. This time it is letting us get up close and personal with her face, or maybe it’s the terrifying idea of her isolation. 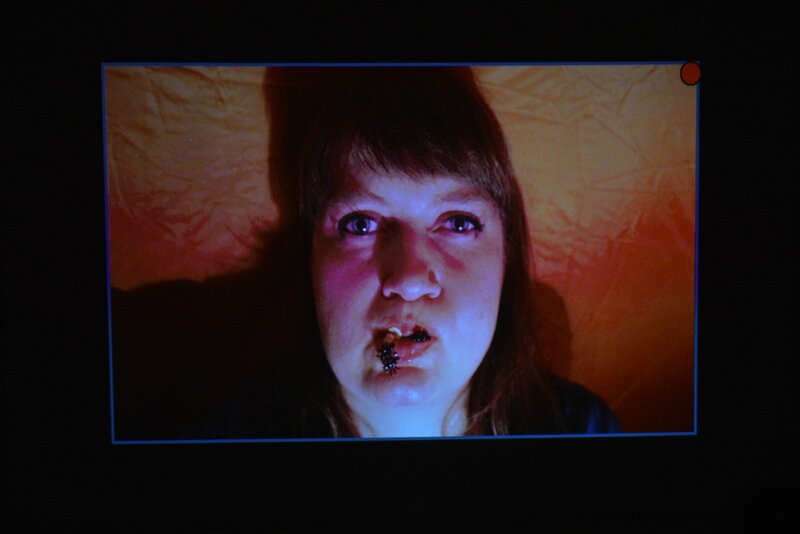 All I know for sure is that while Anya Liftig cares about having symmetrical makeup, she is also interested in challenging personal boundaries and subjectivities, and in structuring her performance practice around her personal economics of space. 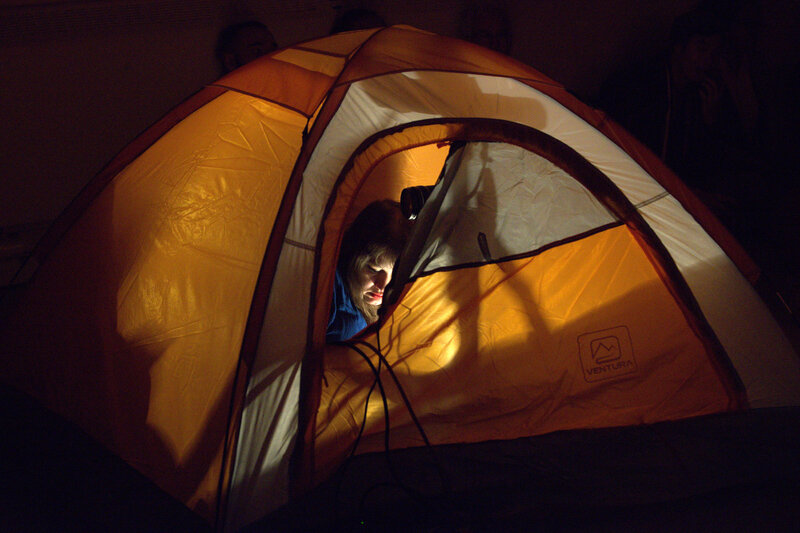 The tent is practical and sized to scale. She’s a face dancer, and the tent is her studio. Fixing her hair, self-consciously finger-combing it and patting it down, she ducks her head below the frame. Reappearing a second later we realize she’s cued the music. The melody is melancholy but catchy (a little godspeedyoublackemperor), but you wouldn’t know if from Liftig’s blank stare. That is, until her nose starts twitching. Her mouth quivers. Her eyes squint. As still as she was a moment before, now there’s an equal control over her facial contortions. With movements that seem to mimic the twists of the music you can almost imagine that she’s the instrument. She’s definitely doing the most (and first) melancholic face-dance I have ever seen. As the music builds, each note pulsing and making her eyes wider and her cheeks tighter, the humour here is apparent, but what’s also clear is that it’s not just for fun. Mediating the space, giving herself an articulated place to perform her self, it occurs to me that if Liftig were to gape open her mouth in the same way she is popping out her eyeballs, the imagery would quickly turn horrifying. As it stands it is sometimes grotesquely alluring how she puffs out her lips, so I stare exclusively at her mouth for a while and her face transforms yet again. There is a sort of frenetic energy coming from behind her lips, and I notice this just before I realize that there’s something in there, and that something is coming out. One by one, small props drop out of Liftig’s mouth. With each teeny toy piece that pops out, so too spills copious amounts of dribbling drool. Tiny bottles, a mini rifle, a plastic turkey, a lobster, a very wet gorilla, all spurt out like eggs being laid by a chicken or turtle. I’m reminded of how these are culturally-reified choking hazards, even though Liftig is clearly no child. Walking a fine line between entertaining us and freaking us out, Liftig has us on a razor’s edge but I don’t realize how paper thin this line is until the music stops. In the silence, the humour is immediately gone from her mouth, still full of plastic ants and saliva that glops off her chin. In the glistening of her eyes and the absence of the pulsing sound, we enter a void just for a moment before the light in the tent goes out. This ambiguous yet practical performance place within a space has ceased to be, and the pathos is stark. 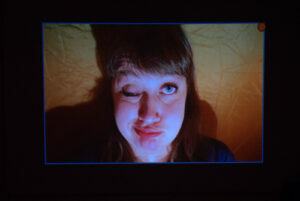 Liftig, for now, has decided to stop dancing and once again, represent her face to the outside world. The second edition of Performance Art Dailies began with an introduction by session moderator, Paul Couillard. He explained the theme of ‘language sound body’ by breaking it down, word for word. Next, taking a few minutes to settle down after Chavez’s rousing statement, the attendees heard about Linda Rae Dornan’s journey from language back to the body through sound. Born in Belfast, Dornan explained that the language of her childhood home was a combination of singing and poetry. When her family moved to Montreal the ways that language and sound were used became even more important. In that time of transition, which included adjusting to a new language and a Quebecois Catholicism, Dornan said that she was offered an opportunity to experience cultural dichotomy and be deeply influenced by it. After she fell in love and got married, her partner John Asimakos developed a form of dementia which stole his language; another transition which created a new life. But this time, Dornan the artist had to decide how the process of making work about your own personal relationships would function after her husband’s illness took hold. The process she described was never precise, and she never imitated her husband’s condition, instead electing to find a way to express how she lived along side him through her work. Today, she continues to focus on performance and video installation, and to present an audio art radio show every week on CHMA 106.9 FM. Couillard’s next question was interested in what the artists think about when they make a performance. Chavez answered first and in many ways redirected the question saying that it’s different every time. Whether she’s in a different place, or is maybe a different animal or perhaps in a completely different state of being, in short, she said making performance is what she is doing when she is living. It is whatever is important to her and others close to her. Chavez described how, for performance to be sincere you must give away who you are. You must give away your essence and talk about everything and speak to everything. Out walking every day, she said, she will perform through her route in order to find her way. Dornan articulated her perspective on intention as a middle-ground between territories outlined by Chavez and Hershorn. She believes what goes into her performances comes back to her, and that in the performative spaces she creates she can trust people will understand what she is trying to convey. “It is the intention,” Chavez said, “but also a consciousness of here and now, a concept, an image, and something that propels you towards it and mobilises you through sincerity.” Suggesting that the main thrust is experimenting with how you see the relationships, how you see what you feel and understand the action so that it can be repeated, Chavez admitted that discussion around these things is interesting, but that you learn best by living it. 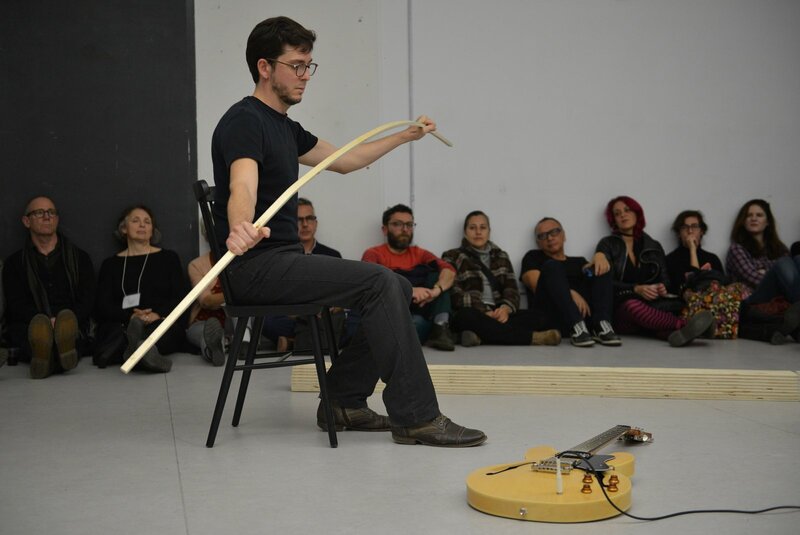 Turning to the audience for final questions brought a query into the ways that the language of sound and body play on the inner life of the performers in their practice. By way of response, Hershorn reminded us that language is a fragile thing, and that feeling your way through language as sound helps reconsider the role of language over meaning. 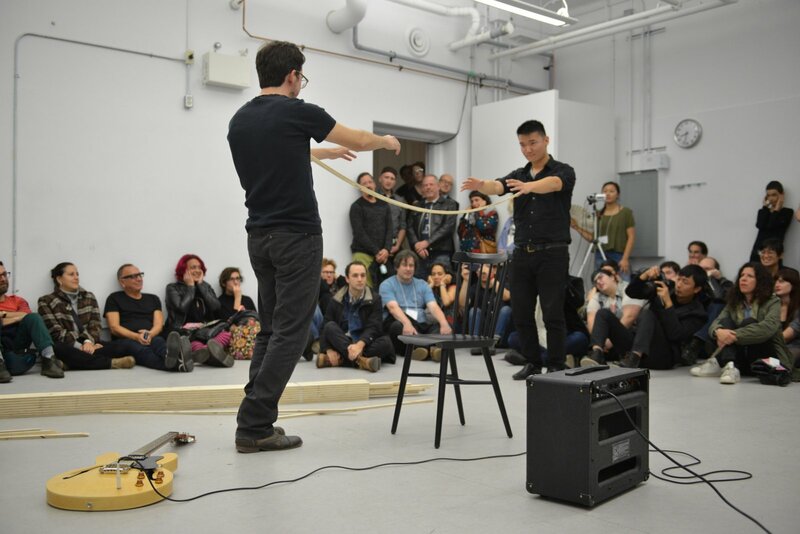 Suggesting that she likes to remove the meaning of a word and keep the sound as a visceral element, Hershorn described how sound is very important to her work as a way to encode language with alternative meanings. As the panel drew to a close, Dornan was asked about developing an intimate language with a partner who could no longer speak. She discussed her husband’s illness (a condition called Pick’s Disease), which eventually rendered him unable to communicate with words. After his ability to use sentences failed, words fell out of his mouth one at a time. He communicated by singing, gesturing, and humming. As the disease progressed he moved to mime. Dornan explained that it took 14 years from diagnosis for all these changes to take place, and that in the end her husband would get his needs across to her by pointing or using his eyes. His non-verbal language had become a style of looking and touching that she was attuned to because they were together, every day. Ending the panel on that note felt appropriate. Though some conversation continued, somehow the threads which had been identified to connect language, sound, and body had been woven by each panel participant into a personal and unique perspective. Where one was grounded in a spoken language that expressed the body, another denied words their symbolic power by transforming them into sound, while the third had found need to engage an intricate landscape of language and sound and body that required acceptance in order to transcend the known and reach toward the profound power of the performed utterance over the semiotic. Despite a 90-minute panel discussion, it felt that the topic exceeded what was possible this time. A rich conversation, there was at least no doubt that it would be continued over the next few days in the performances that were yet to come. The artist pushes and pulls. He threatens to crack. Please… just touch, just break, just reach, hope…just try. It might be enough this time to make this tension subside. “Is there anyone who is willing to hug?” he asks. Christian Bujold’s performance constructs intimacy in ways that strategically conflate it with pain. His confusions, his In betweens, are spontaneously determined yet contextually deliberate, and they lend themselves to a willingness to disappear inside. Not forever. Just long enough so that there is a sense of delay. To push boundaries of accepted behaviours, Bujold evokes and troubles outcomes through the performance of tasks. To test capacities, he forces an environment of sonic disturbance. Conveying a psychological sensory receptivity as much as building into a maelstrom of high frequency dissonance—cacophonic mania rising from just the slightest vibration—the anxiety is incarnate. The execution is affecting and involves holding the tension for as long as possible. Questioning relationships methodically is like a stress test. The outcomes will always lead you to know the weakest points. You’ll learn when your efforts will likely cause a rupture. 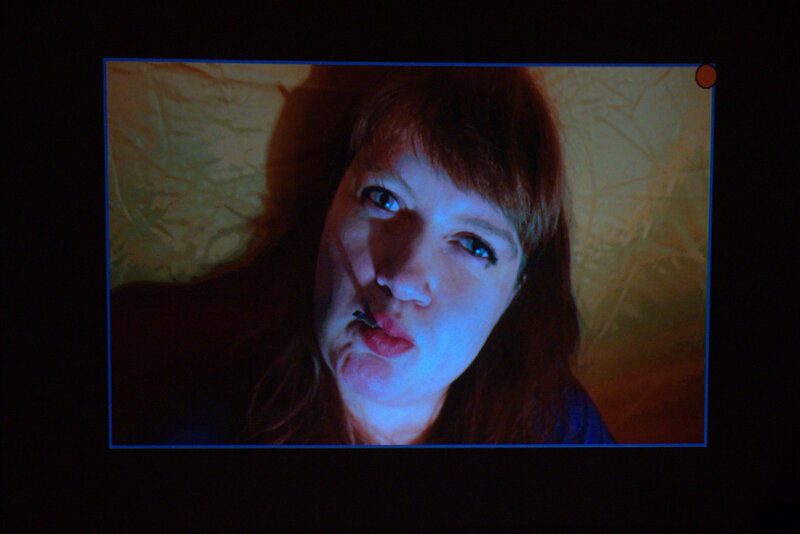 Bujold’s performance as method seems to be asking: how long until, how much can I, how soon will I make it/you/myself… snap? Kurt Johannessen probably doesn’t think about fractals, at least not when he’s performing. I don’t generally consider the self-replicating patterns that approach infinity very often either, so I can understand the idea that it’s not at the forefront of anyone else’s mind. Fractals are natural phenomenon of repeating patterns that don’t alter regardless of scale. Fractals are, in general, a theoretical concept of near infinitely self-similar and iterated replicability. Based on the Latin fractus which means ‘broken’ or ‘fractured’, the idea of a fractal first arose from the study of recursive images, such as what we see when two mirrors are placed in parallel and reflect each other indefinitely, or in what is called infinite regression. Organized into mathematical formula, the concept of fractals has been illustrated by artwork that uses this formula as algorithm to generate geometric patterns that self-replicate, which represents the theory best for the lay person (like me). While this scaled visual representation of fractals is useful, fractals can also describe processes in time. These ideas and images have been on my mind ever since I saw Johannessen’s performance Orange the other night. At first, fractals struck me as an elegant metaphor, a way to draw myself to his process of presence and his focus on creating microscopic variations of an image within the frame of his experience. I was thinking that the concept of ‘infinite regress’ in terms of human consciousness was a way to think about mindfulness as a bottoming out of a moment to reach toward questions of self observing self observing self, and so on. I thought his approach to his materials, and the ways in which he was spare not only with their presentation but in his treatment of them as both precious objects and alchemic ingredients, could also tie in to considering fractals as natural phenomena, with Johannessen performing the minimalist magician. Letter sized paper – stacked. Glass sphere of mustard seeds. Hair from floor – placed on paper stack. Another white box, larger than last, smaller than first. Canister of mechanical pencil leads or pins? Smaller vial of mustard seeds. Petri dish very full of mustard seeds. Fluted vase, very small, filled with mustard seeds…placing with great care. On hands and knees. Using two hands. Trying to balance. As though he’s frozen. Placing vial. It’s unsteady. Spills. Another small vase of mustard seeds. Drops when discovers another hair, which is placed with first. Hair on paper, set aside. Chip – Orange. Becomes 2 chips. Circles. One chip on black canister. One in hand of another. Vial of lead/pins in his hand, he stands on paper stack. Places lead/pins between stack sheets. Opens small white box, and places a fly in another’s hand. Removes it. Places fly on the canister. Takes strip, puts between fingers of another. Places brown stone in hand of another. Empties another white box into another hand. The strips hold words. Sentences. But then, after a little while, I decided to stop hurting myself and feel some things instead. What Johannessen did was that he created qualities using his attention, and ours. He experimented, and he considered these qualities, missing some or feeling his way toward others in a process of locating items and us in relation to each other. I AM ME. YOU ARE YOU. THE SEED IS THE SEED. I AM YOU. YOU ARE THE SEED. THE SEED IS ME. I AM THE SEED. 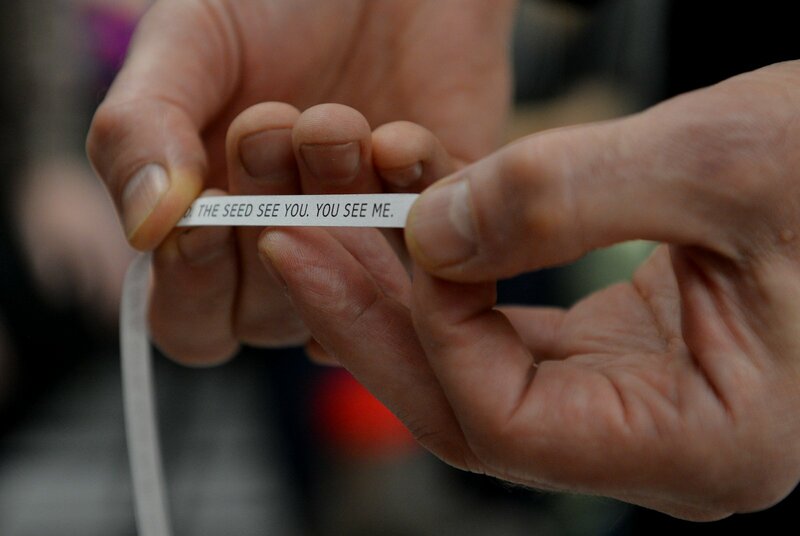 THE SEED IS YOU. YOU ARE ME. I SEE ME. YOU SEE YOU. THE SEED SEES THE SEED. I SEE YOU. YOU SEE THE SEED. THE SEED SEES ME. I SEE THE SEED. THE SEED SEE YOU. YOU SEE ME. I AM ME. YOU ARE YOU. THE DED FLY IS THE THE DEAD FLY. I AM YOU. YOU ARE THE DEAD FLY. THE DEAD FLY IS ME. I AM THE THE DEAD FLY. THE THE DEAD FLY IS YOU. YOU ARE ME. I SEE ME. YOU SEE YOU. THE DED FLY SEES THE THE DEAD FLY. I SEE YOU. YOU SEE THE DEAD FLY. THE DEAD FLY SEES ME. I SEE THE THE DEAD FLY. THE THE DEAD FLY SEES YOU. YOU SEE ME. I WENT TO THE STONES OF NORWAY. I ASKED THE STONES OF NORWAY: IS THERE ANYONE THAT WANT TO JOIN ME ON A JOURNEY TO CANADA?